At the end go left onto Oak Street, Norton Country Clubis .2 miles down on the left hand side.You will see the parking lot area first. Take a left at the first set of lights onto School Street. 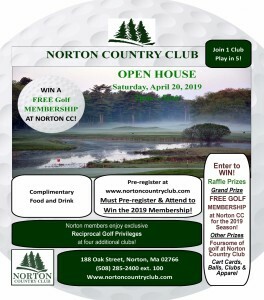 Norton Country Club will be 2 miles ahead on the right hand side. You will see the golf course first before the clubhouse and parking lot.